If the Runner accesses a card and then later trashes it outside of an access (e.g. with Political Operative), can the Corp play Hellion Beta Test on the next turn? No, Hellion Beta Test’s condition requires a card to have been trashed while it was being accessed. If the Runner trashed only one Corp card on their last turn and subsequently used Salsette Slums to remove that card from the game, can the Corp still play Hellion Beta Test? No. Salsette Slums has a replacement ability, so the card is not considered to have been trashed. 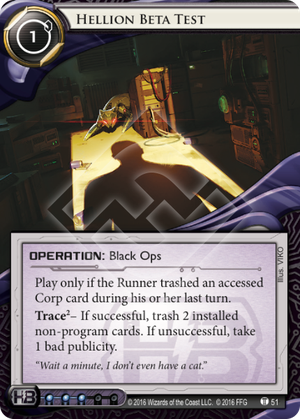 If the Corp plays Hellion Beta Test and the Runner only has one installed non-program card, must the Corp trash one of their own installed cards? "Trash 2 pics of hardware and taste the runners salty tears, otherwise better wait for a later use. If you feel like it you could trash resources but that's a waste"